I have no real reason to publish this picture apart from the fact that I thought it was rather bizarre and I like the bizarre! There that should be an end to this blog. 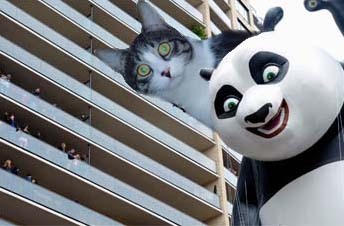 But I thought maybe I could add a few observations. Since when have the British police been allowed to display their tattoos? And what is the female officer doing in the foreground? Checking her mail on a mobile phone I would say wouldn’t you! You know I can imagine that it would take a lot more than six police officers to tackle a real Polar Bear but this poor fancy dress Polar Bear seems rather defeated, poor thing and six police officers with or without rubber gloves is several too many don’t you think? Lastly why is the tubby police officer wearing rubber gloves, does she suspect that the Polar Bear has fleas? As usual British justice and those who enforce it are all very confusing! 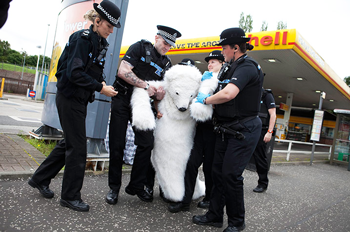 I bet you are wondering why the British were arresting a Polar Bear in the first place aren’t you? Well the answer is that the Polar Bear was part of a protest by a well know ‘green’ organisation who appear all too often on high streets around Europe chugging to mention their name or their cause. For those of you who don’t know what ‘chugging’ means here is my definition. Chugging or “Charity Mugging” is the practice of collecting for ‘charities’ and other do gooding bodies that involves stopping unsuspecting shoppers in major thoroughfares to sign them up to a monthly subscription to some ’cause’ or the other. The subscriptions solicited usually go towards paying for large modern offices and all expenses paid trips abroad for some staff to ‘assess’ the situation whatever that situation might be! Usually it is a ‘situation’ that requires a stop over or two in a four star hotel for several days and then an hour or so at the sharp end whether it be a children’s hospital in Syria, or a Whale gathering in the middle of the Pacific Ocean. 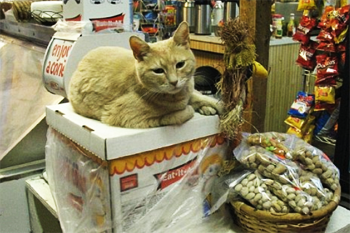 Stubbs the Cat has been Mayor of Talkeetna, Alaska since he was a Kitten and has seen other political players and lightweights come and go in Alaska, he attributes his successful 15 years in office working as the longest serving Mayor in Alaska to very much a ‘paws on’ way of operating. Indeed part of Stubbs success as Mayor is that he like to be close to residents and meaning that Stubbs didn’t, when he was first elected Mayor, spend $50,000 on redecorating his office without the approval of city council like a one time mayor, Governor, then dramatically unsuccessful Vice Presidential Candidate*. Oh no Stubbs’ office is humble by comparison, it’s the local general store, Nagley’s Store, where he can be found everyday constantly snacking on Alaskan Snow Crab, his only Mayoral indulgence. In between town business Stubbs receives around 30 to 40 visitors a day who travel miles just to glad paw him and answers messages from his Facebook account, where he has over a 100 more ‘friends he has never met’ than residents of the small township of Talkeetna (900 for those of you who are curious). 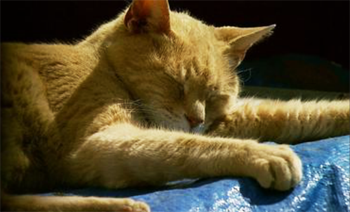 Most afternoons as the sun sinks just after midday in the Fall and all day during the Winter Stubbs takes a well earned nap, safe in the knowledge that he is not only the most successful and popular Mayors in the world but is also a shining example of what a true politicians should be! A source close to Stubbs’ campaign who wished not to be named because of the sensitivity of the matter was quoted as saying that Stubbs may eventually follow another famous Alaskan politician into a race for the White House, but he continued, Stubbs, who has an IQ a lot higher than that unsuccessful Alaskan hopeful, has much to learn about the world and of course needs to always bear in mind that Canada is not part of the US. *”I’m the Mayor, I can do whatever I want until the courts tell me I can’t. '” –Sarah Palin, as quoted by former City Council Member Nick Carney, after he raised objections about the $50,000 she spent renovating the mayor’s office without approval of the city council.